With this recording the Schola Cantorum of St. Peter's-in-the-Loop, founded as the professional liturgical choir of a Franciscan "shrine church" in downtown Chicago, pays homage to the Poor Man of Assisi who was a friend to the poor and the sick, lived a life of simplicity, and loved nature. The pieces include settings of texts written by St. Francis, about him, or on subjects dear to his heart. In Honor of St. Francis traces choral music from the twelfth century through the twentieth and is a true "homage" to St. Francis of Assisi and a celebration of the choral art. The concert Schola is joined by a chamber orchestra for this recording. 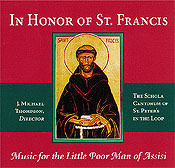 In Honor of St. Francis is a live recording of the tenth anniversary concert performance of the Schola on the solemnity of St. Francis of Assisi. The Schola Cantorum of St. Peter's-in-the-Loop, Chicago, Illinois, sang for the first time on the Feast of Saints Peter and Paul in 1988 at Solemn Evening Prayer. Since that first service, the women and men of the Schola have sung for Solemn Eucharists, Solemn Evening Prayer, Communal Penance Services, weddings, priest's first Masses, simple and solemn professions, ordinations to the diaconate and priesthood, and various other services at St. Peter's-in-the-Loop. Made up of professionally trained musicians the Schola is dedicated to the principles enshrined in the documents of the Second Vatican Council as elaborated by the Bishops' Commission on the Liturgy—to lead the faithful in the singing of the Eucharist and the Liturgy of the Hours, to preserve the treasury of sacred music, and to enlarge the repertory of choral music. The Schola has been invited by parishes in the Archdiocese of Chicago to bring its skills in leading musical worship to them. The Schola is a frequent guest of Ukrainian Catholic and Byzantine Catholic parishes in Chicago and in Munster, Indiana, singing in English, Church Slavonic, and in Ukrainian. Over the last ten years the Schola has also played a large part in the ecumenical and inter-religious work of the Archdiocese and has sung at a variety of inter-faith services. The Schola was featured as one of "Chicago's Sacred Treasures" on a television documentary. Several national organizations have featured the Schola, either in leading worship or in giving concerts. The Schola Cantorum has performed twenty-five other collections produced by The Liturgical Press: Light from the East: Carols from Central and Eastern Europe II; Have Mercy on Me, O God: The Great Canon of St. Andrew of Crete; Music for the Year of Matthew: Hymns, Chant, and Anthems for Ordinary Time, Cycle A; Music for Lent II; Music for Easter II; Music for the Twelve Days of Christmas; Chant and Spirituality; Music for Advent II: Hymns, Chant, and Anthems for the Four Weeks Before Christmas; How Awesome This Place: Morning and Evening Prayer for the Anniversary of the Dedication of a Church; Praise to the Lord: Great Hymns of the Church; Sing the God of Ultimate Justice: Music for the End Time; Music for the Paschal Triduum; Rejoice, Unwedded Bride; Music for the November Feasts: Hymns, Chant, and Anthems for All Saints, All Souls, Thanksgiving, and Christ the King; Away in a Manger: Carols of Christmas, Evening Prayer of Christmas; Christmas Through Candlemas: Music for the Feasts of Light II; There Is Great Rejoicing: Carols of Central and Eastern Europe; This is the Feast: Music of Richard Hillert; In Honor of St. Patrick: Chant for His Feast; O Bread of Life: Hymns, Chant, and Anthems for Use at the Holy Eucharist; Music for the Feasts of Light; Music for Advent; Music for Lent; Music for Easter; and A Service of Compline. "A vibrant collection of 10 songs, hymns, canticles, poems, prayers—most of them using the Saint's own compositions . . ."